During the winter of 2017, a streak of nasty storms, creating multiple tornados and straight-line winds, caused damage to several structures along the Gulf Coast, including Complete DKI’s client, McGuire’s Irish Pub in Destin, FL. McGuire’s experienced severe damage to approximately one third of its flat roof over the main dining area. With peak vacation season just around the corner, the restaurant needed to remove and replace the entire flat roof without causing too much downtime and loss in revenue. Complete DKI was onsite and began tarping the restaurant within two hours of the reported loss, which prevented further damage from the impending rain. Working with a commercial roofer to provide a temporary patch for the damaged roof, the Complete DKI team was able to finish drying the inside of the restaurant, and remove, replace and repaint the ceiling all within just four days. They avoided any downtime by working in sections of the dining room. To provide a permanent fix to the roof and still keep the restaurant in business, Complete DKI was able to locate a tradesman who applied a commercial grade spray application, which was warranted and passed all the local permitting codes. Since the HVAC unit was located on the roof, this was removed, and temporary AC was provided in the interim to allow the restaurant to still operate as normal. Complete DKI coordinated all the reconstruction efforts with the restaurant’s management, allowing for a seamless transition to the new roof. 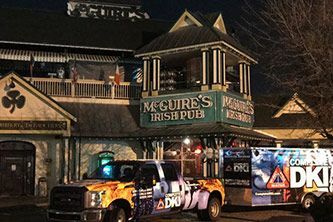 Despite the challenges and additional work required, Complete DKI maintained solid teamwork and communication from start to finish, and prevented McGuire’s from shutting down.